One of the downsides to working out is the soreness you feel after. The soreness and stiffness that sets in within 24 to 48 hours of your workout session is known as delayed-onset muscle soreness (DOMS). In the best case scenario it’s annoying, and can slow down your workouts. In the worst case scenario it can keep you sidelined for days. Lactic acid is a byproduct of the process your body uses to convert glucose to usable energy. When you exercise, the glucose conversion process in your muscle cells goes into high gear and lactic acid builds up in your muscles. This build-up was long considered a primary cause of DOMS. Lactic acid usually clears the muscles between 45 and 60 minutes after you finish your workout; long before the pain sets in. Experts now believe muscle damage to be the culprit. As the muscle tries to repair, blood rushes to the area causing the tissues to swell and tripping the pain receptors in the surrounding nerves. Exercises that cause the muscles to lengthen under force, such as strength training, jogging, and jumping exercises, seem to be the most common culprits. 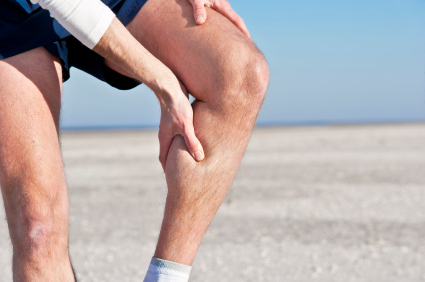 It’s almost impossible to avoid DOMS entirely, but you can take steps to reduce the severity. The best way to reduce DOMS is to start slowly as your body is adapting a new exercise program For example, if you have started a new weight routine, start with weights that you can comfortably lift for eight to ten reps, and avoid increasing the weight until you can comfortably lift for twelve reps. When you do increase the weight, you should do so in small increments to avoid overextending your muscles. If you continue getting DOMS after an established exercise program, it could mean that you need to dial back the intensity. This doesn’t mean that you shouldn’t challenge yourself. It means that you should avoid overdoing it and potentially causing so much pain that you can’t exercise at all. Compression garments encourage blood flow, which carries oxygen and nutrients to your muscles. There was also a study, published in the Muscle Ligaments Tendons Journal, which reported that individuals who performed vigorous exercise while wearing thigh compression garments showed less muscle damage than individuals who did not. Whether you wear thigh garments, full leg, or just knee high socks, compression garments could reduce your risk of developing DOMS. Taking steps to bring down the swelling can help relieve the pain, stiffness, and tenderness associated with DOMS. However, you should be careful because decreasing the pain is not the same as repairing the damage. This is something that will happen over time. Still, reducing your discomfort will allow you to move comfortably. Light movement can also help the muscle heal faster than keeping it stationary. Wrap the affected muscle in a compression bandage to keep it stable and bring down swelling. Elevate the affected muscle at or above heart level. You may not need to use all of R.I.C.E. For many, simple rest and ice during the first 24 hours is enough. A class of OTC drugs known as non-steroidal anti-inflammatories (NSAIDs) can reduce muscle swelling and relive the pain. Ibuprofen (Motrin), aspirin, and naproxen (Aleve) are the most common OTC NSAIDs. Acetaminophen (Tylenol) is not an NSAID, it won’t reduce the swelling, but it may help relieve the pain. Topical pain killers, like Icy/Hot, Ben Gay, and capsaicin cream can also reduce the pain. Products like Icy/Hot also have a cooling element that can bring down swelling. Massage can help relieve the muscle stiffness and encourage healing blood flow through the muscle. However, if you are experiencing severe pain, you should avoid using massage within the first 24 hours. Because massage encourages blood flow, it may cause the swelling to increase. If you apply an ice pack to the area, it will bring down the swelling without you losing the benefits of the massage. Consult your doctor if your condition does not improve, or worsens, after 24 hours, if you develop a fever; if you have dark, red, or cola-colored urine; or, if you lose mobility in the affected muscle. One of the downsides to working out is the soreness you feel after. The soreness and stiffness that sets in within 24 to 48 hours of your workout session is known as delayed-onset muscle soreness (DOMS). In the best case scenario it’s annoying, and can slow down your workouts. In the worst case scenario it can keep you sidelined for days. Consult your doctor if your condition does not improve, or worsens, after 24 hours, if you develop a fever; if you have dark, red, or cola-colored urine; or, if you lose mobility in the affected muscle. High Reps and Light Weights for Muscle Growth? Is It Pointless To Do Sit-Ups If You Have Excess Belly Fat?